SAN DIEGO, Calif. /California Newswire/ — As smart phones become increasingly popular, people expect more out of the mobile technology now more than ever. To keep up with consumer trends Club List Now, a club event search engine, is releasing a mobile web version for the Apple iPhone on May 7th, 2009. The iPhone website is a simplified search engine version of the regular website that returns a list of main event titles. The details for each main event can be viewed by clicking on the event name. Once the details are displayed, they can be collapsed and hidden by clicking on the event name again. People are still able to sign up on the guest list just as if they were on the regular website. This version of the website is geared towards club goers on the go who are searching for events to attend. 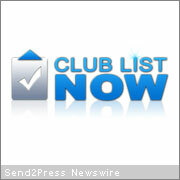 Club List Now is headquartered in San Diego, California and offers services such as event searches for club goers, guest list tracking for event promoters by using patent-pending unique event HTML codes, promoter contact searches for club managers as well as marketing opportunities for various types of vendors. More information: http://www.clublistnow.com, or info@clublistnow.com.